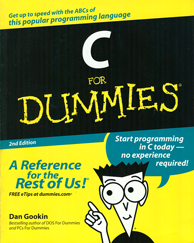 This page supports my book, C For Dummies. In the middle of Chapter 3 I wrote a Pop Quiz! where one of the answers is told to be on page 516. There is no page 516. It's a joke. The answers to the quiz should be obvious if you've read the book up to page 35; the "wrong" answers are very, very silly. The GCC error message referring to __gxx_personality_v0 is probably appearing because you typed the source code name in using ALL CAPS. Yes, that's what I use in the book, which is traditional. But for some versions of Linux, you must use a lower case c as the filename extension or GCC thinks that you're creating something other than a C language program.